Having a medical assistant or nurse handle the paperwork related to patient visits can help you be more efficient and increase revenue. Here’s how to calculate the value. Are you getting paid for non-face-to-face prolonged care? One of the most frequent complaints I hear from physicians is about the work done before and after an office visit, whether done the same day or another day. They say it is frustrating to spend so much time on those activities and receive no payment. As 2017 draws to a close, the Medicare program is notifying physicians how they will be evaluated and paid for treating patients in 2018. In case you’re not an avid reader of the Federal Register (and most people aren’t), let’s go over some details. If you or your practice plans to participate fully or partially in the Merit-based Incentive Payment System in 2017, and you plan to report 90 consecutive days of data for the year, then Monday, Oct. 2, is the last day you can begin. As of May 1, Congress changed the rules for how the pilots of small private planes may choose to receive medical clearance to fly. Instead of undergoing the full FAA-sanctioned physician exam, certain pilots can get certified by their personal physician. Family physicians saw their average overall compensation increase last year, and they felt slightly less anxious about their pay and their profession, according to a new report. The Medscape Physician Compensation Report 2016(www.medscape.com), released April 1, reported that family physicians made an average of $207,000 in total compensation in 2015, up 6 percent from the previous year. Most specialties saw gains in annual compensation, with the highest-paid physicians being orthopedists with an average of $443,000. The lowest-paid specialty was pediatrics with an average of $204,000. In addition to receiving higher pay, 52 percent of all physicians (and 52 percent of family physicians) said they believed their compensation was fair. By comparison, half of all physicians and 48 percent of family physicians felt they were fairly compensated in 2014. Dermatologists (66 percent) felt the most comfort with their compensation, while urologists (42 percent) were the least satisfied. Among family physicians, 73 percent said they would still choose medicine as a career if they had to do it all over again, which is up from 69 percent five years ago. The percentage of family physicians who would stick with the specialty, however, has fallen from 44 percent in 2011 to 29 percent now. The trend of physicians choosing to work for hospitals and other large health care groups appeared to remain steady with 35 percent of men and 23 percent of women sticking with private practice, virtually the same percentages as a year ago. Male and female compensation continued to have a disparity, but it is shrinking. Male family physicians made an average of $220,000 versus $183,000 for female family physicians, a difference of 20 percent. The difference was 28 percent in 2011. Also, survey results showed that female physicians faced a similarly sized pay gap regardless of whether they were employed or self-employed. Despite the continued focus on “direct primary,” “concierge,” or “direct pay” care models, those types of practices remain very much in the minority. Only 10 percent of family physicians reported being in a concierge or cash-only practice, the same amounts as in 2014. The researchers said it appeared private practice physicians looking to get away from the regulatory and financial headaches of traditional practice are more likely to go into employed positions rather than go the direct-pay route. 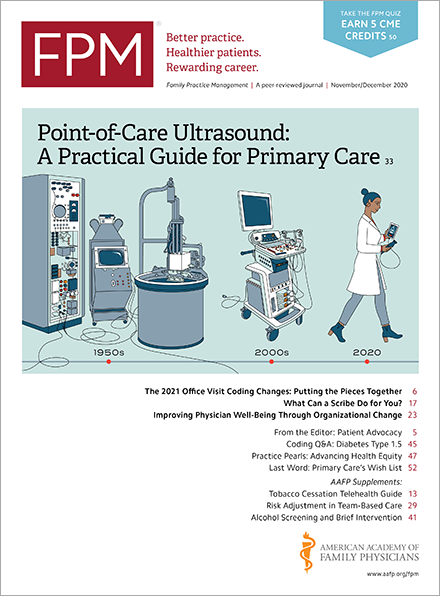 The survey also said 39 percent of family physicians were in an accountable care organization (ACO) and 7 percent planned to join one in the coming year. By comparison, 35 percent belonged to one in 2014 and 8 percent planned to join one.